So long my friend. – My thoughts on a page. You may not know it, but Ireland is a little quieter today. There is a little less noise, a little less banter, and a lot less laughter. For today, my pal and I, said a fond farewell to our Thursday morning buddy, Denis, who at 83 is leaving Ireland for a new life in England. His son arrived on Saturday night, and a van was loaded up with all he wished to take with him. I called a couple of times over the weekend, and then this morning it was time for our final meeting. It was, as always, largely filled with humour, but today our pal was obviously distracted. His time remaining was ticking by very loudly, and he said he’d found sleep hard to come by last night. Eventually we could put it off no longer. My friend was to say her goodbyes first. I turned away, as it was difficult to watch. He had a real grá for her, and vice verse. They shared their final hug and she tearfully drove away. However for me there was to be a bit more time. It had been decided that I would accompany Denis and his son to the bank, so happily I got a reprieve, a stay of execution. On our return I decided to be strong, no more tea, no more chat, I would not go in to the house. It was time. We stood beside the car and I spoke to his son advising him I was going to head away home. He shook my hand and thanked me for, sitting chatting, drinking tea and enjoying a morning of storytelling every Thursday, looking after his dad. I couldn’t stop my tears, and without realising what I was saying, I embraced him and said, quite threateningly, ‘You had better look after him‘. He laughed and assured me he would. Then kindly he said, ‘I’ll leave you two to say your Goodbyes’. I turned to my pal, standing tall, with two sticks for support, and tears falling down his face. ‘Ah dear, he said, I can’t believe it has come to this’. I as good as ran to him and hugged him close. ‘I’ll miss you’, I said, ‘now you behave yourself over there, and enjoy your family!’. We straightened ourselves and smiled at each other. ‘Bye Denis’, I said and I kissed his cheek one last time. He stayed at the gate as he always does, waiting as I turned my car, to wave me off. As I passed by I pulled over one last time, and wiping my tears I laughed and said, ‘For Gods sake Denis, you’re still making women cry at your age’. He threw back his head and laughed his lovely hearty laugh, his eyes twinkling as always. He blew me a kiss and shouted ‘Love ye’, to which I replied, ‘And I you’, as I drove away, oblivious to the road ahead, so busy was I looking in the mirror behind me. So my friends he is gone. Our loss is his families gain. For there is indeed another side to this story. Denis was beginning to fall over occasionally. He lived alone and at his age life was not going to get any easier. 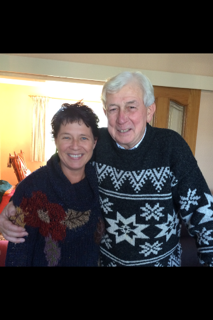 His son had explained to us that his family in England all live beside one another, and there was also the fact that there were three very excited great grandchildren counting the days for the arrival of their great grandfather. As I write this, I acknowledge that indeed yes today I am sad, and lonely for Denis, but I am also smiling. For I have no doubt he has a wonderful new life ahead of him, surrounded by family, and maybe even new friends, but most especially, there are three young children who are about to get the best Christmas present they will ever receive…. their great grandfather. Photo credit…. Me and Peggy! Yes for one post only there is a real photo of me, and my friend Peggy, and our dear pal Denis. Crying at your post, so well written, creative and full of love for your dear friend (family member), Denis. I suspect, he is going to miss you as much or more than you’ll be missing him. Such love between the two of you. A beautiful read. Thank you! Me too. I cried. He’s a very young 83 and hopefully his grandchildren will make him feel young too. Fabulous post, Tric. I saw you this morning, we passed on the road just past your house. 2 sad people in their own worlds. Thanks Bryan. I was in a bit of a state afterwards alright, but writing this helped hugely. I know it was the best thing for him, and I know that once he settles he will be happy. Ya made me cry again Tric but it was a beautiful post and tribute to your friend. You know he will be happy surrounded by family! I didn’t think I would but I do feel happy for him. He will adore having great grandchildren around him as he is wonderful with children. Sorry for those tears. Can’t wait for getting back to making you laugh some day soon. Isn’t he fab! He has just left Ireland by boat in the past hour. I feel so sad for him as it is not what he wanted but yes it was brave of him, and definitely the right thing to do. Imagine the excitement of those little ones waiting for him to arrive and I know he won’t disappoint. I will not comment on my own photo! Ah tears in my eyes here but in a good way! So you know how i feel. It was magic while it lasted. I was thinking today this is worse than fostering kids! Thanks Beth. I’ve been really off since he left. I do know though that he is in the right place now. Oh look at these faces!!!!!!!!!!!!!!!!!!!!!! ❤ Thank you for letting us see this connection. And don't we all cry a little bit, and leave a bit of us behind, when we have to leave Ireland???? Thanks Colleen. Struggling all week since he left, all creativity has obviously traveled with him, hence so long even replying to your comment. This week should be much better. I hope it is better. I hope you let us know how he’s doing. Beautiful post, seems like you all have had a wonderful connection. You can’t even imagine how fond we were of him. Both of us are so lonely without him. Ah well as he’d say himself, ‘Such is life’. Sorry so late replying but I’ve found writing difficult this week so haven’t been on my blog very much. Lovely photo Tric and although it is sad that he is leaving Ireland, isn’t it wonderful that he has a lovely family to go to. He sounds like the type of man who will make friends wherever he goes. I do agree though, we Irish have a pull for this land and it must be so hard to leave it especially at his age. 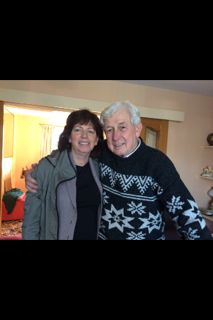 We saw so clearly how much he loved Ireland, and how exquisitely he expressed that love. I must admit I’ve struggled a good bit missing him all week. That’s why I’m so late replying to you! What has made a big difference is knowing that his great grandchildren and family will so love having him, and in time vice verse. Saying goodbye for the last time more than once in the last two years, and every time it has made me cry as well. It’s never easy Karen, and it’s hard to forget. Thanks a million. It’s a strange emotion, but even a few days later we both are still missing him so much. Thursdays will certainly be different!. Delighted for his family though. Sobbing! What a beautiful friendship. Thanks so much. We miss him dreadfully. I hope to ring him in the next few days, but fear making him lonely. He had emailed us, courtesy of his son I’d say. I can’t imagine how hard it must be for him to adjust, but for us it will always have been a real joy just to have met him. Trust me, I was sobbing writing that! Pingback: Just call me Nancy. | My thoughts on a page. Pingback: Remember my old friend? – My thoughts on a page.